MostCreepy.com - Slenderman is a tall, thin, and flat-faced creature. According to the urban legend Slenderman has an ability to lengthen his body. Another legend says that Slenderman has tentacles that grow from its back. Another story says that Slenderman can make victims forget their memories, insomnia, paranoia, coughing ("slender disease"). If people try to take a photo or video or him, the photos or videos become blurred. Another Slenderman ability is moving instantly. Because of its popularity, the Slenderman story has been made in the form of movies and video games. Slenderman usually appears using a suit. However, it cannot be sure whether the suit is cloth or skin shaped like that. He comes from evil forces and the reason for this is still unknown until now. So far there are two opinions regarding the appearance of SlenderMan. The original version describes him as a person who is not only evil, but also very dangerous. He will do strange things such as removing your organs and putting them in a bag, then he will hang you on a tree until you run out of blood, or he can also follow you and make you got mental disorders. Another image shows Slender Man as a very passive aggressive person, often allowing someone to investigate things that are very disgusting in his mind and slowly causing insanity when they are no longer able to handle them. If you make him angry, he will chase you until he catches you and you will disappear with him to an unknown location (it can ruin you or damage you mentally). This version also explains that at the time of its appearance, cameras, CCTVs, and various other electronic devices will begin to experience problems. 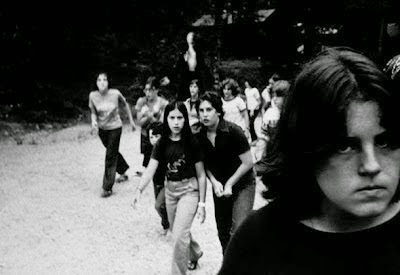 Sometimes someone can determine whether he is close to a Slenderman only with the help of certain electronic devices that react to Slenderman, such as radio, television, or camera. 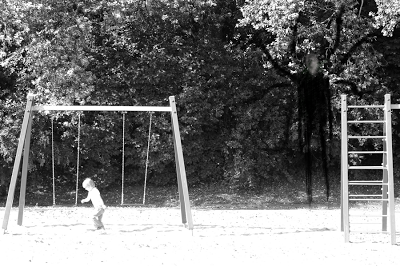 Slenderman actually comes from a photoshop contest. The contest had the theme of something terrible so that everyone had to make creepy photos to win the contest. On June 8, 2009. This contest was held by the Something Awful (SA) Forum. Participants from this contest are required to turn ordinary photos into creepy images through digital manipulation and then post their work in paranormal forums to deceive people, so that the actual photos are only mere edits that are considered real. The participants immediately began sharing their paranormal photo creations by inserting ghost images and other strange things, not forgetting that some participants also included fake stories to make the results of their works more convincing. On June 10, Victor Surge posted two black and white photos that he said he got from the library. In the photo, showed a tall creature who was watching over unnamed children, with a brief explanation in the photo, Slender Man a mysterious creature that lurks children. Slenderman finally came out as a winner in the contest, but after the contest ended, it was not expected that the creature would become truly real.